Enhancing the African focus of the University of Cape Town’s (UCT) LLB degree and altering the way students and staff view law are just two of a few long-term goals that the new Dean of the Faculty of Law, Professor Danwood Chirwa, aspires to achieve during his tenure. Last week, UCT’s acting Vice-Chancellor Professor Loretta Feris announced Chirwa’s appointment to the university community. He takes over from Professor Hugh Corder who had been serving as faculty dean in an acting capacity. Chirwa joined UCT in 2004 as a lecturer in commercial law and has a wealth of institutional knowledge and experience. He has held various leadership positions in the faculty, including acting dean in 2014 and head of the Department of Public Law from 2009 to 2014. “I am humbled by my appointment and by the overwhelming support I’ve received from staff and students. They believe I will add value, bring stability, improve the way we work and the services we provide – that’s encouraging,” he said. But being Dean of Law was never part of Chirwa’s life plan. In fact, neither was law. “I became a lawyer by chance, not by design,” he quipped. His first career choice was science or engineering. But after his high school experienced some administrative challenges with their mathematics exam papers in his matric year, education authorities disqualified the school on the subject. This meant that pupils were unable to register for any university degrees that required maths. Chirwaʼs only option was to study education in the Faculty of Humanities at the University of Malawi, where he emerged as the top student in the faculty that year. As a reward for academic excellence, he was presented with the South African High Commission Award and a scholarship to study law. “In Malawi, you only get into law school after studying something else first, so I qualified. I struggled in my first year. I was more of a maths and science student. But I learned it [law] and since then I’ve not looked back. I have no regrets about my career choice,” he said. Chirwa explained that his responsibility is two-pronged. He described himself as the interface between various constituencies including management structures within the university and faculty, staff and students, and faculty and external agencies. He will be responsible for the efficient and effective running of the departments and ensuring that faculty views, experiences, practices and traditions are taken into consideration in UCT’s policy development processes. On the other hand, when it comes to the greater university structure, implementing and adhering to policies and practices are high on the to-do list. Creating a vibrant academic atmosphere that encourages collaboration both internally and externally is what he hopes to achieve while at the helm. Building an institutional culture, with the help of staff and students, that ensures everyone is more engaged and creating an atmosphere that is inclusive, collaborative and encourages debate is one of his goals. “That’s the side of the faculty I am interested in changing. Moving from an individualistic atmosphere to one of collegiality is necessary,” he said. There’s a lot of work to be done. Changing and diversifying the faculty in a meaningful way is one priority. And while there have been several “excellent appointments” in the past two years, it’s not nearly enough. He emphasised the need for ongoing mentorship to grow and develop existing junior staff and raising the profile of the departments to attract external academics to enrich research and teaching. By 2029, the Faculty of Law should look and operate on a completely different level. “What we teach, how we teach and who teaches should be different in 10 years’ time,” he said. 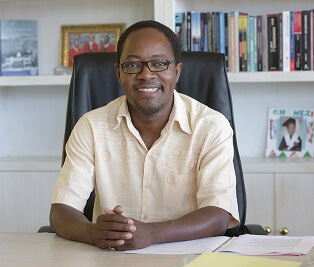 By then Chirwa would like his faculty to weigh in on debates on social justice in the country and on the continent; local and global inequalities; regional economic integration and the impact of globalisation on the third world – Africa in particular. He also hopes to redefine the faculty’s research direction, develop new research areas and refine existing ones. He said the faculty’s research units are producing “outstanding work”, but the need for ongoing development remains critical. “In 10 years from now we should have a better handle on what it means to teach law through the lens of decolonisation. That’s political jargon, I know. But there’s an academic [element attached] to it and we need to address it,” he said. Adequately preparing law graduates to be the best in the country and the region in order to compete with the best in the world is another key focus. While promoting rigorous teaching, Chirwa also aspires to lead a faculty that cares and is responsive to students’ needs. “We need to be a faculty that addresses students’ concerns promptly and effectively, while upholding our values,” he said.